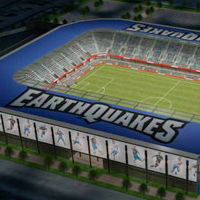 Despite having its groundbreaking back in October, the new stadium of San Jose Earthquakes still exists only on paper. Actual construction should begin on February 26, bizjournals.com reads. It's been quite some time since the historical groundbreaking that gathered over 6,000 participants, symbolically starting the construction works. But over many weeks that passed, works were ongoing mostly in the offices of the club and city of San Jose. “We had kind of targeted that date," club president Dave Kaval told bizjournals.com, explaining that the privately financed 18,000-seat stadium is on track for completion by the spring of 2014. "It’s been a tremendous amount of work." The project, worth $60 million is to be the latest addition to MLS, the American league of football.